Posted by murphylt on Monday, August 10, 2015 in Uncategorized. We are excited to announce that a new version of the Anchor Link system has officially launched. The new web and mobile interface represents a more user friendly version of the previous site with substantially more modern look and feel. The main features of Anchor Link have all remained but locations of certain functionality are now different. 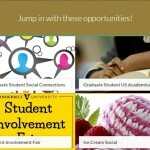 The home page features campus announcements, a link to your organizations, your Co-Curricular Programs progress bars, and the opportunities board which displays upcoming events. 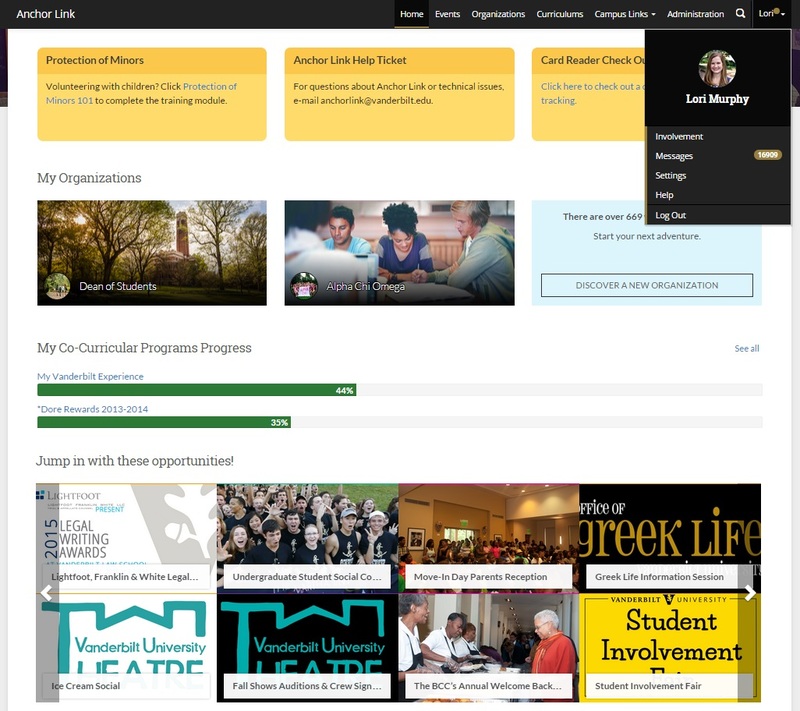 To access the features previously listed under “My Involvement”, click your name in top black tool bar and select “Involvement”. Check out the highlights of the new interface below and test out the site for yourself. Please note that the location of the attendance tracking tool has changed. Anchor Link is now mobile responsive meaning that all pages are formatted to work on cell phones and tablets. The (much needed!) upgrade to the mobile interface will allow you to easily access the information you need while you are on the go. Anchor Link now makes searching for organizations, events, and news even easier with the new Search tool that you can access by clicking on the magnifying glass in the top black toolbar. The “Track Attendance” button is now located at the bottom of an events in the “Manage Events” section shown below. Organization home pages now serve as a better reflection of your organization’s activities and feature upcoming events, photos, and news stories. 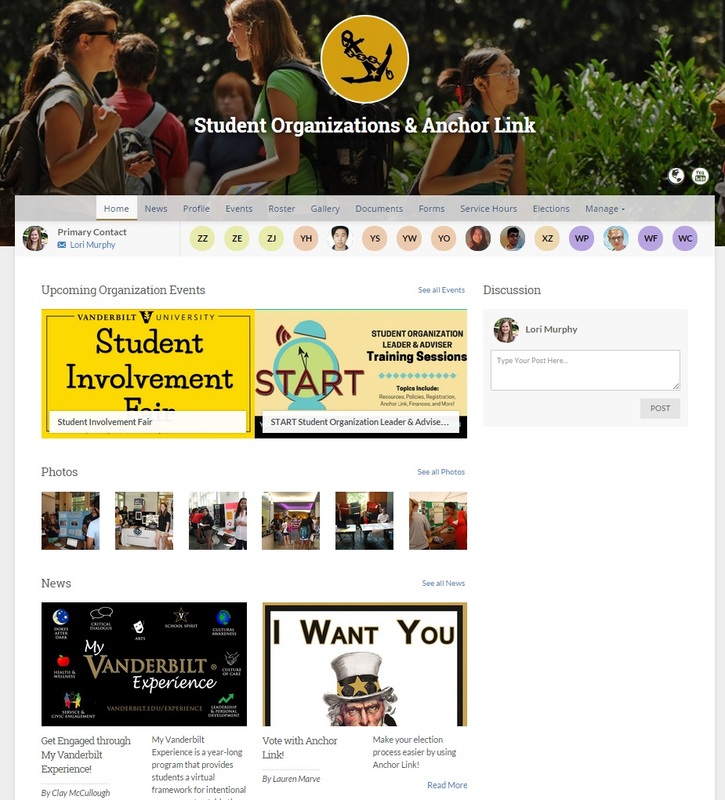 Does your student organization’s home page look empty? 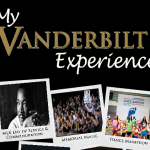 Work on updating your content today so that students interested in your organization can see all that you have to offer! The new site features images such as event photos, profile pictures and organization cover photos in different dimensions than the previous site. For instructions on how to properly format and upload these images, click here. Updated late last spring, the Messaging tool in Anchor Link now permits custom listserv-style e-mail messaging using an organization’s roster. Many organizations are beginning to utilize this tool to conduct their business and communicate with members..
To ensure you continue receiving all e-mails for your organizations, make sure that you are a member of the group in Anchor Link. If you are no longer a member and do not wish to receive messages, please remove yourself from the roster.